A veteran stalwart of the Travel and Tourism Industry in India, Mr. Mahender Singh brings to the table nearly three decades of exemplary service across a wide range of prestigious organizations which together make him a formidable force as far as being a representative of this dynamic and exponentially growing facet of the Indian economy is concerned. Starting out with Peacock Travels Private Limited as Manager, Operations nearly three decades ago, back in 1983; Mr. Mahender Singh continued to function in that role for 5 years till 1988, after which for as many as 15 years, he remained the General Manager of Registan Tours Private Limited. For the next two years until 2005, Mr. Mahender Singh functioned as the Director of Karni Kripa Tours & Travels Private Limited. 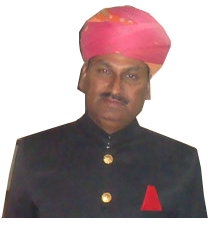 From 2005 till date, Mr. Mahender Singh has been the Managing Director of KK Holidays and Vacations. Royal Rajasthan is a glittering jewel set amidst the golden sands. The light that reflects off the desert dunes engulfs a land renowned for its vibrant colours, locals in bright attire and beautiful jewellery, living in towns and cities dotted and dominated by towering forts and palaces that rise from the sands, almost like a mirage. Nowhere does history come alive as thrillingly! Captivating Kerala enjoys unique geographical features that have made it one of the most astonishing tourist destinations in Asia. An equable climate, long shoreline with serene beaches, tranquil stretches of emerald backwaters, lush hill stations and exotic wildlife, picturesque waterfalls, sprawling plantations and paddy fields, Ayurvedic spa centres and enchanting art forms gives travellers a unique and unforgettable holiday experience. The largest of the states in the northeast of India is Assam whose capital, Guwahati, has an inspired location on the banks of the River Brahmaputra. Amidst Assam’s verdant lushness are two important game sanctuaries, Manas and Kaziranga, both best known for their population of one horned Indian rhinoceros, a species that faced extinction. Much of the rest of the state is devoted to tea plantation which yield the strong Assam leaf. Situated in the rain shadow area of the mighty Himalayas in the state of Jammu and Kashmir, Ladakh is known as the 'Cold Desert'. The snow covered mountain peaks and the panoramic views of the place attract plenty of tourists every year. Some of the world's most highest passes are situated in Ladakh. The bewitching beauty of Ladakh is sure to capture the imagination of one and all. A honeymoon is the first holiday, which a newly-wed couple spend together to celebrate their marriage with plenty of surprises, moments of intimacy, privacy & full of romance. It’s great opportunity for two sole mates to get away from the stress of the wedding & spend some quality time in an exotic & romantic honeymoon destination. This is something that bridal couples remember these golden memories for lifetime. Sikkim Darjeeling provides the perfect ambiance of a hill resort with it's mild climate and laid back charm. Its verdant hills and valleys are steeped in colour, and are interspersed with vast streatches of rolling green tea gardens. Presiding over all this is Mt. Kangchenjunga, the third highest mountain on Earth, looming over the northern horizon, giving a magical aura to the land that leaves one's senses intoxicated. North India has the unique ability to keep the footprints of its past intact, while opening a door to the present. Whether you choose a Golden Triangle Tour or one of our Rajasthan tour packages, North India is packed full of culture, adventure, history and legend and is a great place for family travel. Those on the lookout for adventure can opt for a wildlife safari in Uttarakhand or a camel safari along the golden sand dunes.